On the night before Pope Francis issued his encyclical calling for people to take better care of the environment, Archbishop Joseph W. Tobin offered young adults in the archdiocese an approach to life and happiness that connects with the pope’s goal. The archbishop shared that advice during a talk with about 150 young adults in a Theology on Tap get-together in Indianapolis on June 17. 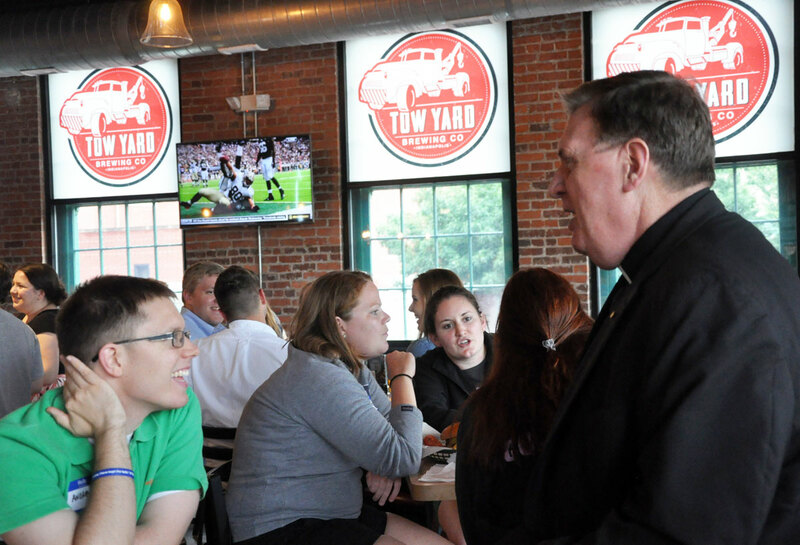 Sponsored by the archdiocese’s Young Adult Ministry and held at the Tow Yard Brewing Co., the evening reflected Theology on Tap’s approach to invite young adults to consider aspects of their faith in an informal, relaxed setting. Asserting that the encyclical “will have major repercussions in the Catholic Church and, I believe, the world,” the archbishop encouraged the young adults to read the pope’s letter. His talk also served as a starting point to consider many of the themes that Pope Francis expressed in calling all people to take responsibility for the care of God’s creation. “Stewardship of creation is more than something we do,” the archbishop told the group. “It’s a response. We’re responding to someone who loved us first. It’s a way of being and understanding our place in the world. It’s integral to all we’re called to do as Catholics: to respond in love to God who loved us first. The archbishop stressed that the Church’s approach to “care for creation” calls people “to look beyond our own selfish needs,” to focus on all humanity. He noted how power plants are often located near low-income neighborhoods, and how “air pollution from these plants contributes to health problems, especially in the young and the elderly. Concern for the most vulnerable must flow from the care that God has for all his people, the archbishop noted. God’s example should also guide people in their care for the environment, he said. In the course of his talk, the archbishop suggested that the young adults could make a difference on a global level by supporting Catholic Relief Services in its efforts to help people around the world. At a personal level, he talked about recycling, using energy-efficient lighting, reducing the use of fossil fuels, embracing a simpler life, and having faith be the foundation of a conscious choice to care for all creation.